Whether it’s alt indie pop or guitar-dense indie rock projects, Alt and Modern Rock II has a wide array of drum grooves and sounds perfect for multiple indie genres. 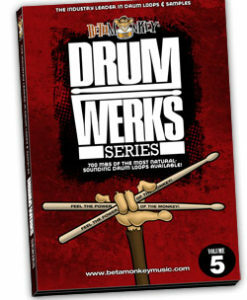 Diverse in drum sounds and very versatile for modern songwriting styles. Rhythm and Groove with Indie Attitude! Alt and Modern Rock Drums I was such a success that everyone wanted more! 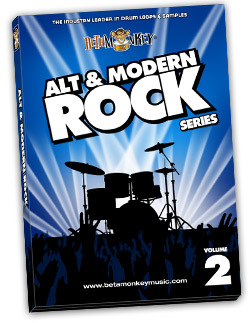 Alt and Modern Rock II again offers great drum grooves and diverse sounds, a versatile collection of drum loops for modern songwriting styles. With 900+ Modern Rock, Alt Rock, Indie Rock drum loops, creating new drum tracks has never been more inspiring. The Alt and Modern Rock II drum sample library showcases a live, powerful, and versatile library of loops to create realistic drum tracks. Tempos 60 bpm to 142 bpm. This loop collection showcases grooves for a variety of alt and modern rock styles. Containing main grooves, alternate grooves, and drum fills, Alt and Modern Rock II will propel your drum tracks to new levels of creativity and inspiration as you write new indie, modern, and pop-rock music. Over 900 loops to get your music going!